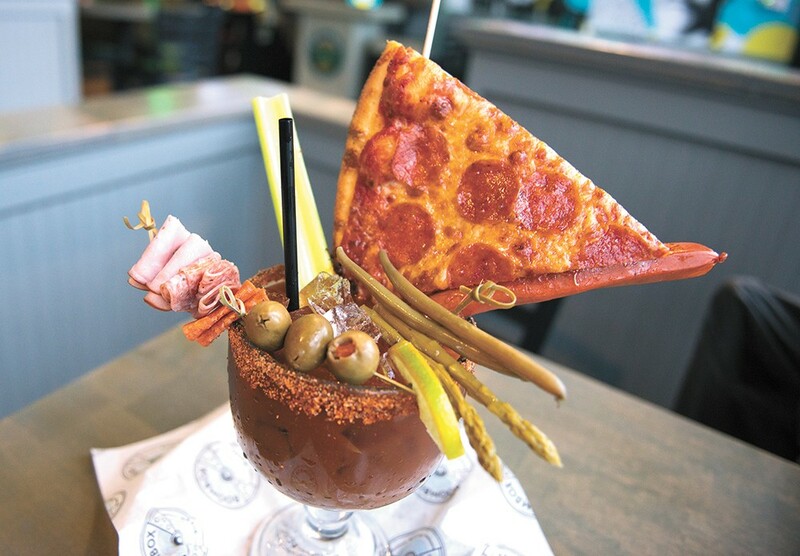 I've never been as intimidated and also intrigued as I was when I first saw the bloody mary at Boombox Pizza. It landed on the table with a clank. I gawked at the meat stick inside the 32 ounces of blood-red liquid and the piece of pepperoni pizza resting on top. Would this be the end of me? Maybe. Would it be worth it? Probably. "Everyone sees it and goes, 'whoa,'" says General Manager Carter Swedo. "People come in just for that bloody mary, and they don't care how much it costs," Swedo says. Swedo says Boombox Pizza wanted to do something special and fun when it opened last year. They saw bloody marys in other cities that had hamburgers or fried chicken on top of it, but Boombox Pizza's specialty, of course, is pizza. It took awhile to figure out how to actually get the piece of pizza to stay on there, Swedo says. When it's fresh out of the oven, the cheese falls off and into the drink. Boombox solved that problem by putting the pizza in the fridge for a minute before putting it on the drink with a skewer between the crust. They make their bloody mary mix in-house and add two shots of alcohol. Then they stack some Canadian bacon, pepperoni and salami — the same meats they use for a pizza. They add pickled asparagus and green beans, olives, celery and the meat stick they get from a local sausage producer. And there it is: A signature drink. "We wanted to try something new that we haven't seen around Spokane yet," Swedo says. The original print version of this article was headlined "Best Bloody Mary: BOOMBOX PIZZA"